Oh umm, hey! I made us some cheese… in a creamy indian sauce!! No I literally made us some cheese. Well, not us, me, but you know. My grocery store didn’t carry paneer (or they do, but they were out), so I decided to make my own. It was actually so incredibly easy and if you are interested, I used this recipe from The Kitchen. It only takes thirty minutes and it was actually kind of fun. If you have the time, I would totally give it a try. It’s kind of cool saying you made your own cheese, or at least I think it is. But this recipe isn’t for homemade paneer. Nope. Today I am telling all about how I fried the paneer in a skillet, made it crispy and then tossed it in a creamy cashew Indian butter sauce. I know, I know. The Indian food lovers are going insane right now. It’s good stuff, semi healthy and actually a very simple, quick and easy recipe to make. Yeah!! 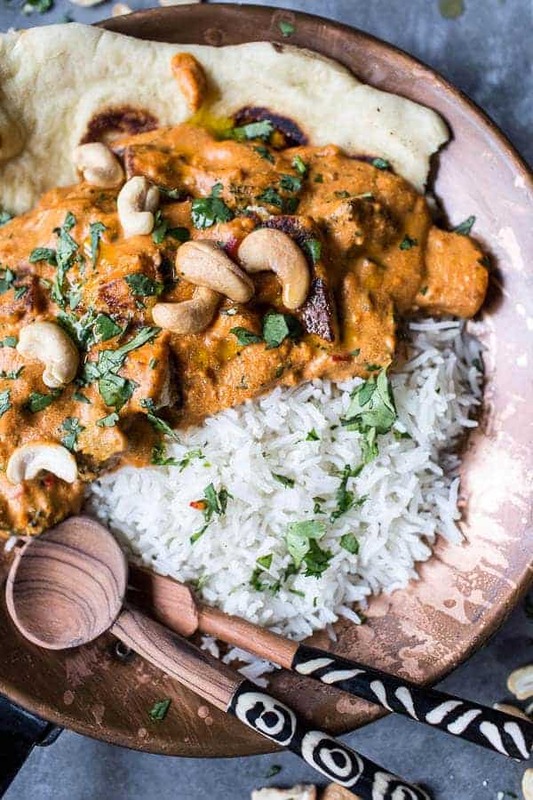 I used my Healthy Crockpot Indian Butter Chicken as a guide for this recipe. That Butter Chicken recipe is probably my most viewed and well liked recipe, it seems people really love it!! Which is kind of weird since I will not lie, no one in my family went head over heels for it. I mean, I loved both of these recipes, especially the sauce, but my family really doesn’t like Indian food. It’s such a bummer. Oh well, more creamy cashew Indian butter paneer for me and you!! But can we just talk about that crispy paneer? I mean, it is totally not necessary for you to do this step, but why wouldn’t you? It is so good and it gives that somewhat bland cheese such nice flavor and texture. Please try it!! Oh and the sauce? 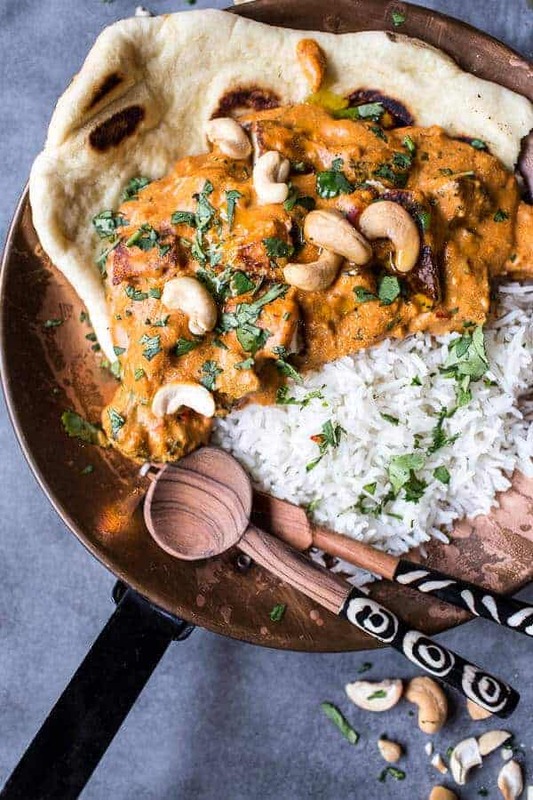 I know it is not traditional to have cashews in butter chicken, but then again neither is swapping the chicken for paneer. 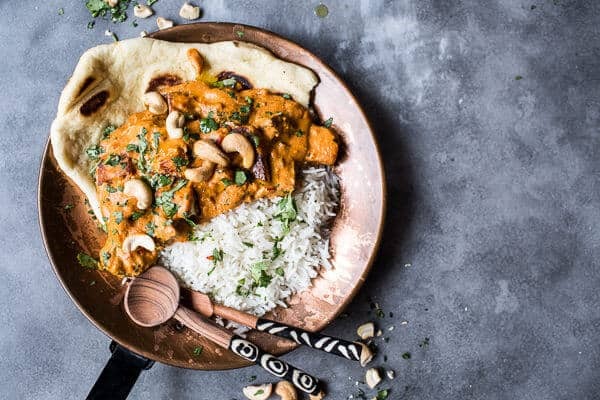 So since I was already going all wild and crazy, I kind of thought, why not add just a little more creaminess and flavor to this sauce by adding cashews. It keeps the sauce so incredibly silky without actually have to add any cream, like in traditional butter chicken. So really, we have a completely healthy and slimmed down version here. Nice!! Honestly though, I do think the reason I made this recipe was just yet another excuse to have a creamy sauce to dip that naan into. 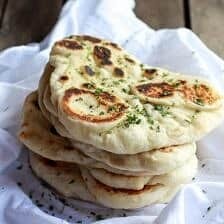 That naan, ah, it is a VERY loved recipe around here! 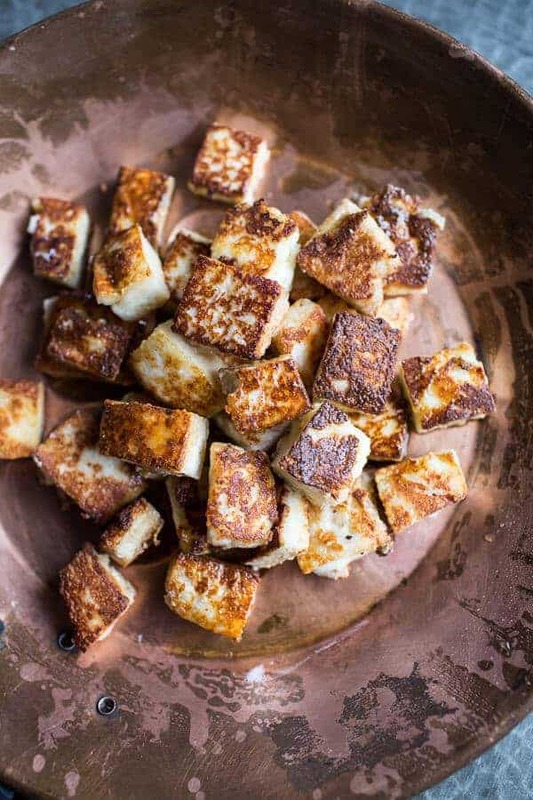 Creamy Cashew Indian Butter Paneer...with Fried Paneer! But this recipe isn't for homemade paneer. Nope. 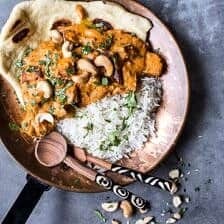 Today I am telling all about how I fried the paneer in a skillet, made it crispy and then tossed it in a creamy cashew Indian butter sauce. I know, I know. The Indian food lovers are going insane right now. To a food processor or high powered blender, add the cashews and coconut milk. Blend on high until completely smooth and silky, about 3-4 minutes. Add the tomato paste, yogurt and 1/2 cup water. Blend until smooth. Set aside. To the same skillet you fried the paneer, add the remaining tablespoon of oil. Once hot, add the onion, garlic and ginger, cook about 5-8 minutes or until the onion is soft and lightly caramelized. Add the curry powder, thai red curry paste, garam masala, turmeric, cayenne and salt. Cook one minute and then stir in the cashew/coconut mixture. Bring the sauce to a gentle boil and if it seems too thick for your liking, stir in water or coconut milk to thin. Once the sauce is at your desired consistency, stir in the crispy paneer and saffron if using. Add the broccoli and cook until warmed through and the sauce thickened slightly, about 5 minutes. Remove from the heat and serve over a bed of hot rice sprinkled with chopped cilantro. And don't forget the naan for dipping! *You do not have to fry the paneer. If you wish, you can just add it directly to the sauce without frying. So make the naan and the enjoy! Wow, that looks really good. Creamy and delicious. I’ve never heard of paneer! Now I have to look into it. Was so excited when you used the phrase you made “us” some cheese. Then you corrected yourself. Ha. I love it when people cook for me…..or give me a little help. Naan is wonderful too! 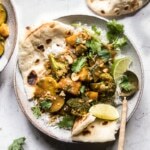 I love garlic naan but I have not tried paneer but after seeing these pictures I will have to try it–looks so good. Actually, well pressed extra firm tofu is a great vegan substitute for paneer. 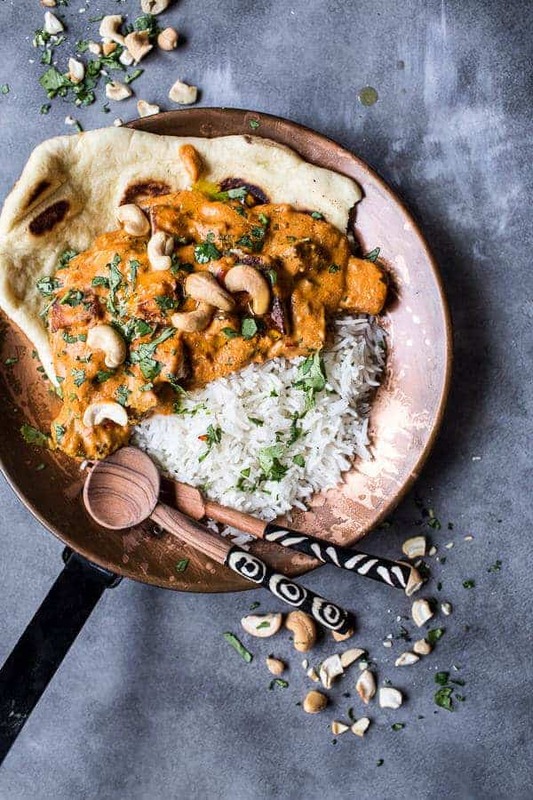 I love Indian food and everything tastes better when scooped up with warm Naan…love this . I love making paneer, it’s so satisfying! Much like making your own ricotta, it’s worth it. My daughter and I just made paneer this past weekend! It was so easy and they say it also freezes. We haven’t tested out our frozen batch yet. Can’t wait to try this recipe. Where is the “bow-down” emoticon when you need it? Seriously this recipe is the pinnacle of comfort! And of course you made your own paneer, because you’re awesome! Can’t wait to try this out! Those utensils… Where did you get those? I love them!!!!!!!!!!! Thanks Ashley!! My parents found them for me. 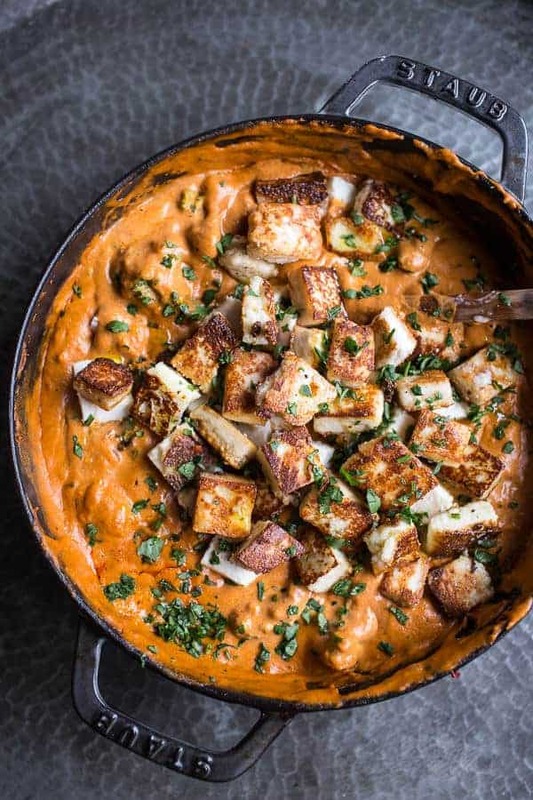 I believe they where in Boulder, CO.
Ahhh loving how this paneer makhani can be veganized 🙂 Pinning! OMG. OMG. Omg. “The Indian food lovers are going insane right now.” ME, HERE, RIGHT NOW. 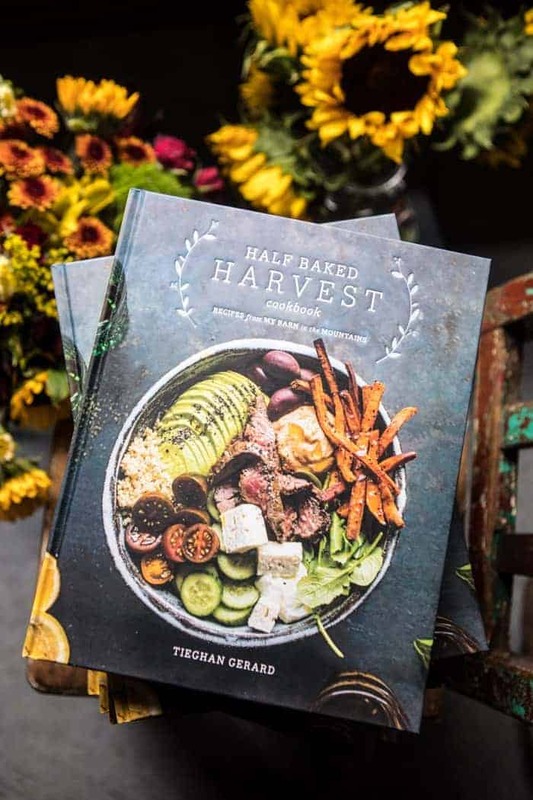 This looks so, SO, SO good, Tieghan!! I can’t EVEN. Frying the paneer first is literally making my heart go pitter-patter. Too, too amazing! Yay! 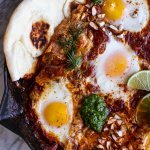 I love when you post vegetarian recipes! Totally making this. Yes please! 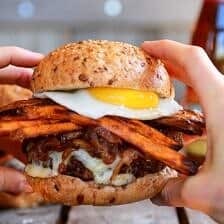 It’s lunchtime and this is exactly what I’m craving! Love that fried paneer! ……. HOLY SCHNIKES! Must try to make that SOON!! I am trying to hold myself back from licking the computer screen right now! 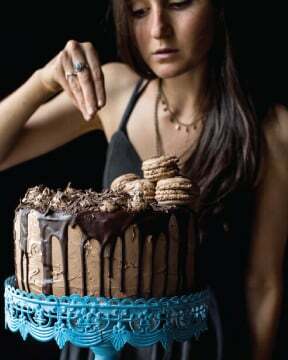 So making this tonight! Thanks for a great blog! Love butter paneer and I always always try to go for crispy skillet fried paneer when making any paneer based dish cause the FLAVORS!! Yummm!! Girl love your photography!! 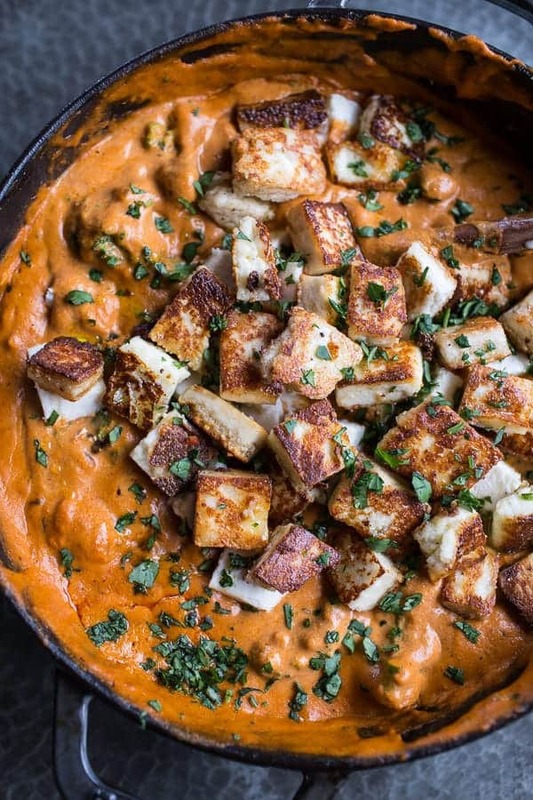 Paneer is a creamy curry is basically my FAVORITE thing in the whole world. I always order mattar paneer when we go out and over eat cause I have 0 control over my passion of indian food! So much creamy goodness! And those paneer, omg! Oh… my… gawd! This looks absolutely incredible!!! I love paneer, but fried paneer?! Sign me up! Made this tonight. I followed the recipe exactly (as is my tendency the first time I make something, modifications come on the next making) and this was absolutely PERFECT! So thick, rich, and creamy! What a treat! Thanks for the recipe! Made this last night for dinner and have to say that is was really delicious. Picked up some paneer and pratha at the local indian market. Next time I will try my hand at homemade paneer and naan. This recipe is a keeper. Any suggestions on how you would modify the sauce to be nut-free? I have family coming into town and everyone loves Indian food, but one of my nieces has a nut allergy and I would hate for her to be left out. That said, I’m making my own paneer this weekend no matter what! Mmmmm! You can simply leave the cashews out, no big deal! Hope everyone loved this, thanks!! This recipe looks delicious! And not intimidating which is a must because I have tried making butter chicken a few times before and was always disappointed. 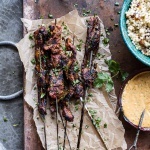 I will try making this recipe but with chicken instead of the paneer. I do have one question: Could I substitute ground almonds (almond meal) for the cashews? Thank you for your lovely posts! I actually do not think that would work that well. If you would prefer not to use cashews, they can easily just be left out. Let me know if you have other questions. I just made this and it was absolutely amazing! Wonderful recipe – thank you. I am indian. 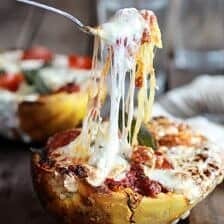 I was looking for a paneer recipe and found this one on the web. I had all the ingredients on hand so thought of trying it. I can’t say enough about how much I liked it. I know indian flavors really well and this tasted exactly like it would if it came from a very good indian restaurant. Thanks! This is the closest thing I have ever made that smells and tastes like Indian food from a restaurant! It’s incredible!! I made my own Garam masala because it’s not always easy to find. Have any more Indian recipes? So happy you lived this!! Yes I have tons of Indian recipes, just search Indian in the search bar at the top of that page. Thank you!! Hi Jessica, sorry this did not fit your taste. Thanks for your feedback. This was so delicious! And it came together really quickly, too. I loved the texture of the paneer with the creamy sauce. Will definitely make this again! 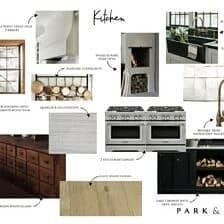 Can’t wait to make this over the weekend! And I love the serving spoons too – I have the same ones, purchased in Kenya 20 years ago! Made this last night and it was really tasty. Loved the combo of the cashews and coconut milk. I had everything but the broccoli which I substituted with green beans. I fried the cheese in half butter half coconut oil which worked well. Question – do you have any tips for keeping the cheese from “popping” and splashing oil? I assume the popping comes from the water in the cheese. I did dry it off out of the package but it still had a few explosions. This recipe is a keeper.